Almost a year old now, I recently ran across an article that talked about the GOP’s funding retraction for the NC Biofuels Center and how it was politically motivated. The article can be read in full at http://www.eenews.net/stories/1060003013. I don’t know much about eenews.net, but the article reads very bent towards the political left, and didn’t really have any weigh in from the Republicans or any real mention of mitigating factors that may have contributed to the Center’s demise. From a North Carolina biodiesel producer’s perspective, I have a few thoughts on the matter. I met with the leadership of the Biofuels Center many times. They came and visited my plant in 2011. There are 5 biodiesel plants in North Carolina, and that year was the year we became the largest producer in the state. I liked them instantly as they were very respectful and friendly. They were not, however, very well educated on biodiesel or how it is produced. I expected more I guess, being they were from the “Biofuels Center”. I got multiple questions about fermentation, distillation, or similar ethanol type biofuel questions which had no application in my plant. They were eager to learn, but I felt they should have come more prepared (and apparently I wasn’t the first biodiesel plant they had visited that week). And that summed up in a nutshell the focus of the Biofuels Center (BC): They were focused almost entirely on ethanol and ethanol based crop research. The goal set by North Carolina was lofty: “By 2017, 10 percent of liquid fuels sold in North Carolina will come from biofuels grown and produced within the State.” Almost none of that, apparently, was envisioned as coming from the five biodiesel plants that already existed in North Carolina. Logistically that made some sense, in that they needed at least a few very large biofuels plants in NC to be able to meet such a lofty goal as was set. I know at least 3 of the 5 biodiesel plants (including TBI) would have happily accepted ANY incentives to expand our plants to meet the goal. But the BC wanted ethanol. Triangle Biofuels never got any financial support from the Biofuels Center, even though we contacted them and applied several times. Where they did provide financial support, grants, or research assistance is well documented, but as far as I know there were no major allocation of funds ($250,000 to Blue Ridge Biofuels is the largest and only real grant I’m aware of) provided to any of the existing biodiesel plants for expansion to help meet the 10% goal set by the State. To be fair, the $250,000 award to Blue Ridge is a sizable award by most biodiesel plant measures, but comparatively it was too small. Much of the awards went to municipalities or research programs for university programs. Their failures are also well documented, such as “Clean Burn” (see featured image above) in Raeford, NC, which received millions in funding and incentives but went bankrupt before it ever produced any ethanol. Needless to say, it’s 2015 and we will come nowhere close to meeting that goal in 2017. Most likely, it never really had a chance to begin with. Lyle Estill of Piedmont Biofuels said this in the article: “Looking back on the center, Estill said that its leaders would sometimes ‘impose petroleum thinking on the biofuels endeavor.’ In other words, the center aimed for big projects that require massive quantities of feedstock.” Lyle and I often don’t see eye to eye, but I respect his expertise and passion for biodiesel as a fuel, and his perspective on this issue is dead on in my opinion. He too wanted to see the smaller plants receive funding to help them grow, and possibly spark additional plants into production. That, of course, never happened. The idea of the Biofuels Center was a fantastic one; it was noble, and it was timely. The people that worked there were ambitious, talented, and passionate. Their execution however, was flawed and misguided. Factor in the budget constraints that most states were operating under, the lack of any significant substantive accomplishments by the Biofuels Center towards the goal set for 2017, the low ROI on funds allocated to the center, and it isn’t difficult to understand the Legislature’s decision to stop funding the center. Triangle Biofuels president Zack Hamm discusses his Wilson-based biodiesel facility and the importance of locally produced fuels to rural economies with Biofuels Center communications manager Shane Reese. North Carolina has had 8 plants that produce biodiesel. That is not as many as some other states in the Midwest, but it’s a good amount for the Southeast. What is odd about that is the fact that North Carolina is not a very good host to biodiesel, in spite of what the state government claims. There have been many lobbies to try to get additional support for biofuels in North Carolina, yet very few of them have been enacted. There was a push several times for a tax holiday on biodiesel, didn’t happen. There was a push for mandated biodiesel blends for all diesel sold in the state, didn’t happen. There was a push for a supplemental tax credit for biodiesel sold in the state, nope, didn’t happen either. What’s interesting is how many other states actually have done something. The following information was provided by the NC Department of Revenue, Motor Fuels Tax Division. It lists the number of states that do not charge tax for biodiesel. Oddly, NC has the highest tax on diesel fuel in the Southeast at $.30 per gallon (Georgia has the lowest at $.15). So, if NC had no tax on biodiesel it means that B99 (pure biodiesel) would be cheaper by $.30 per gallon, and blends such as B20 would be $.06 cheaper per gallon. States with no tax on biodiesel: Idaho, Kentucky, Missouri, Montana, New Jersey, New Mexico, Oklahoma, Oregon, South Carolina, Tennessee, Vermont, Washington, Wisconsin, Wyoming. That’s 14 states that seem to want to promote biodiesel by providing an incentive for the customer to by not taxing it. The rest apparently can’t seem to do without the tax revenue. Pity. 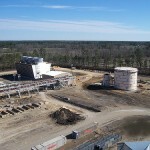 North Carolina has a state funded Biofuels Center called the Biofuels Center of North Carolina, and a goal, as published on their website that says “The goal of North Carolina’s Strategic Plan for Biofuels Leadership is that by 2017, 10% of liquid fuels sold in North Carolina will come from biofuels locally grown and produced”. Considering that South Carolina, Tennessee, Kentucky, and Virginia all have better incentives for biofuels than NC, I don’t see that happening unless the NC Legislature starts taking this seriously and providing incentives for producers to make biofuels, and consumers to buy it. So far, that’s not even remotely happening in this state.